My parents took me to London when I was thirteen years old. Real estate clients/friends of theirs held a wedding reception in London; my dad flew for Pan American Airlines; off we went. So I did. It was every bit as wonderful as I remembered–and then some. Our ‘home base’ for the trip was Hengrave Hall–then run by nuns, now apparently a premiere UK wedding venue–in Bury St. Edmunds, Suffolk County. I was 21. At 21, my dad was in the Air Force, stationed in Bury St. Edmunds. Life is funny that way. At thirteen years old, C19 fulfilled a life goal of traveling to Costa Rica with students and teachers from his middle school. The kid had been clamoring to go to Costa Rica since he read a picture book about the rain forest at age four–how many of us get to check off bucket list items at such a young age? Having experienced my own life-changing trip at his age, how could I say no? Through the almost daily emails we received from his teacher (“Your son keeps trying to touch the animals!”), we knew he was having a great time. And his trip led to us spending Guy’s sabbatical summer in Costa Rica as a family. Today we dropped Q13 at San Francisco International Airport, entrusting him to the care of three middle school teachers and three parent chaperones as they travel to Europe. Specifically, London, Normandy, and Paris. That’s right: I was thirteen when I first visited London, and my thirteen-year-old son will be in London for Easter weekend. This parenting gig gets easier and harder, all at the same time. A mom with whom I’d never spoken before got teary as she reflected on letting her oldest child venture out: “But you’ve done this before…!” Yes, I have done this before. A few times, actually. Still, I have had sleepless nights recently. Technicolor stress dreams work through my out-of-control feelings, my fears of letting my youngest leave my nest. Tossing-and-turning and oh-just-get-up-already! nights, just to make lists rather than pointlessly swat at the bitey-itchy mosquitoes to-do’s that buzz my brain. True to character, he would not could not settle down to pack until the night before, when we discovered that of course he had lost one shoe from his pair of sneakers (in his locked PE locker?) and his new rain jacket (not sure when he even wore it? ), a replacement for the identical rain jacket he lost last season. I can only imagine what he might lose along the way, and I’m so grateful the chaperones have hold of his passport. Last night he went to bed with a book he’s read previously, a ‘familiar friend’ to calm him. This morning he admitted he read until 3 am, caught up in the story, surely, but also…anxious. Of course he is. As am I. But he’s also ready for this adventure, including the misadventures that create travel memories. Travel at a young age changed my life, which affects my inclination to allow my kids to follow travel bugs down their own winding paths. Their travels have, in turn, changed not only them but also me. I can’t wait to hear his stories. I can’t wait to see how this trip might lead to more. I know he just left, but I can’t wait to get him in my arms again. Even though that will mean letting go…again. My friend Tracy works for an in-town start-up company-charity called Sydney Paige. Founder Courtney Brockmeyer left the corporate world to spend more time with her darling daughters, Sydney and Paige, to indulge her passion for education, and to model for her daughters how one person can make a difference. Sydney Paige is like TOMS shoes: buy one-give one. I buy a pair of TOMS shoes for me, they donate a pair to someone in need. 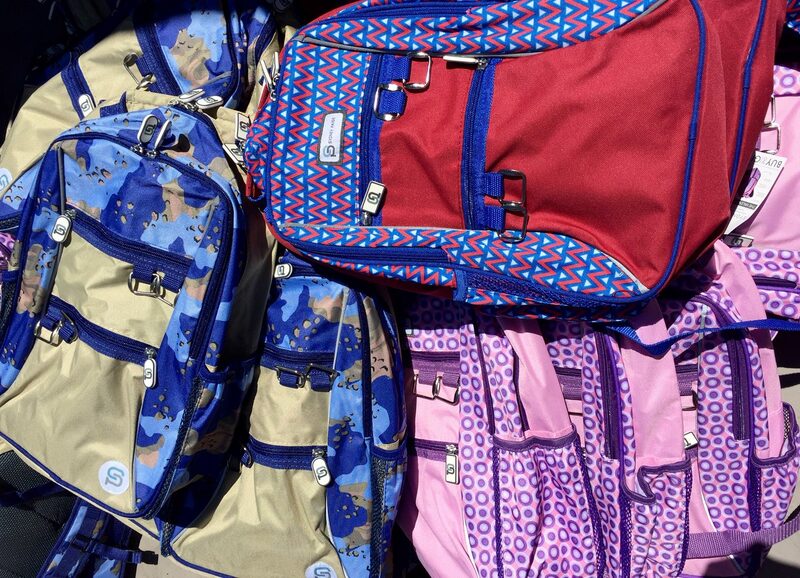 You buy a Sydney Paige backpack for your child, and they donate an identical backpack to a child in need. All good! 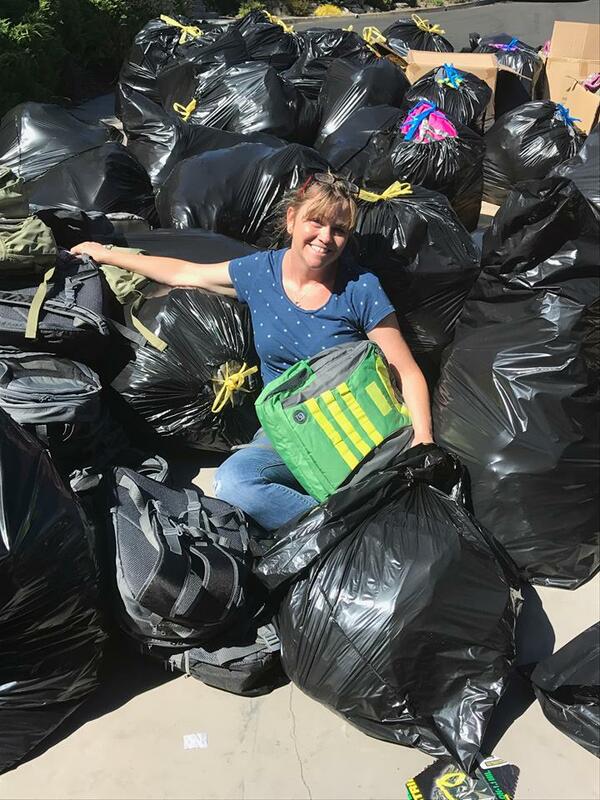 Tracy emailed that they needed volunteers to pack backpacks for homeless children in San Francisco. Kids in our area are always adding to their volunteer hours, and parents appreciate opportunities to teach our children solid hands-on lessons about using our time and actions to do good, be better, and love others. 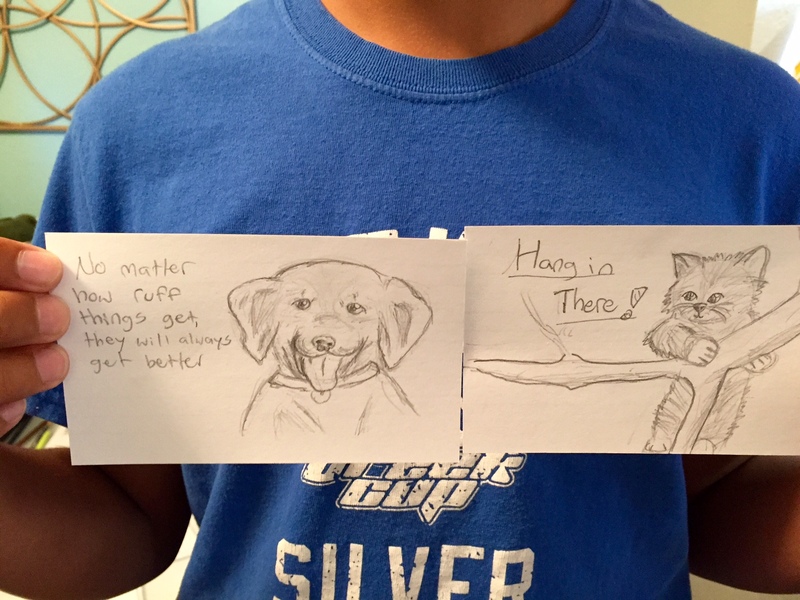 I mentioned it to Tween; he replied, “Yah, maybe…” (he is loving long summer days of video games and bike riding and swimming with friends…). His Scout patrol leader made it a requirement, so we both signed up. We arrived at Courtney’s garage to walls of boxes and volunteers hiding behind each corner. Our first task: to write notes of encouragement that would be stuffed along with age-appropriate school supplies in each backpack. Tracy explained: “Some of these kids aren’t told they are loved. Some have parents who think school is a waste of time. We get to tell them they can do it, that school is important and so are they.” Tears! We opened boxes of backpacks, took them out of the plastic, and unzipped the main pocket. We assembled color-coordinated stacks of school supplies, and then we stuffed. For an hour and a half, we worked diligently until additional volunteers arrived to take our place. In the car he said, “I kinda feel bad about leaving.” I almost turned the car around. Instead we had a heart-moving conversation about volunteering and new opportunities he might pursue this school year. Two days later we received another plea: 12,000 backpacks were arriving at the warehouse ten days early. Could we help? We spread the word: Tween had one available friend and Teen had three. Eight of us showed up at the warehouse to rearrange boxes to create space, unpack supplies, and write more notes. We would have given more time, but three of our eight were leaving that afternoon for nine days of work at a Kids Alive International orphanage in the Dominican Republic; their travel schedule made for a narrow window of opportunity. We volunteered because helping others is the right thing to do. Because we want to teach our kids that a little effort goes a long way in the world. Because our kids brought other kids and the good multiplies. Because our kids are Scouts and, as the Scout slogan says: “Do a good turn daily!” It wasn’t hard, though it wasn’t necessarily convenient, either. Still, it was important. We helped Sydney Paige and, in turn, Sydney Paige donated 24 backpacks to Kids Alive. This isn’t always the way the world works, but it should be. Good comes from good. Invest your time wisely. Do a good turn daily. noun 1. the act or process of orienting; 2. The state of being oriented; 3. An introduction, as to guide one in adjusting to new surroundings, employment, activity, or the like: New students receive two days of orientation; 4. Psychology, Psychiatry. The ability to locate oneself in one’s environment with reference to time, place, and people. Synonyms: direction, location, adaptation, assimilation, bearings, coordination, familiarization, position, lay of the land, sense of direction, settling in. I awoke with vague dream recollections: three of my former professors (college? grad school?) had pulled me aside to say that I needed to go back to school. Apparently my Ph.D. awaits me, in some area of study at some school. Do I have college-envy? I’ve heard other parents of college-bound kids say that college visits evoked similar responses in them, that they wish they could go back to school at this stage of life. Last week Guy and I accompanied Teen to his college orientation. As we walked across campus I thought: “This is the exact right place for my kiddo, but I would have gotten lost here.” Something like 30 of my private, liberal arts college would fit on his university campus. He is our first-born. I am grateful he’s found his place, and anxious for him to transition well. After helping him maneuver life for eighteen years, it is so hard to let go, to cheer him on from a distance, to know that he will succeed and he will fail and somehow it will all work out. His departure will change the day-to-day reality of our family’s operational structure. I will carpool Tween to places Teen has shuttled his brother. We will redistribute his chores. Our grocery bill will decrease. I will miss him like crazy, and sometimes I will (quietly) exult in the new quiet his absence will create. We will hope that he will fit in time to communicate on occasion beyond “Dad, I need money!” (To which we could respond, “So do we!”). None of us understood why the college required orientation prior to the days just before classes begin this fall. In fact, Guy almost didn’t sign us up for the parent-family track. We’re both college graduates—how much can have changed? Teen just wanted to register for classes online and spend every minute of summer with his friends at home. Turns out, we didn’t know how much we didn’t know! He does want to go to college. He knows this is his school, his program, his time. 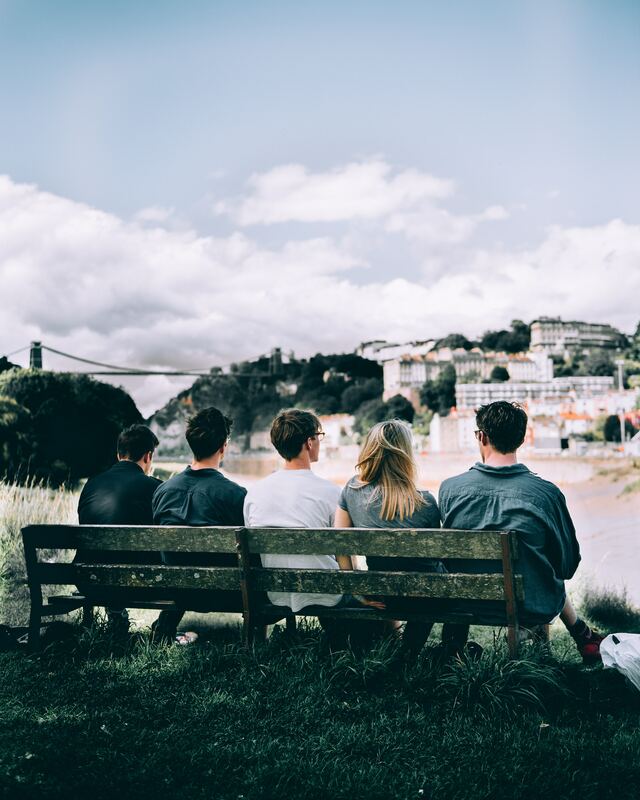 He knows that, even though his friends will mostly attend schools on quarter-system and it seems now that they have longer summers, they will leave eventually, too. He doesn’t want to be the one left behind. He just doesn’t know how to manage the biggest transition in his life thus far. And here’s the synopsis: It isn’t the changes that do you in, it’s the transitions. They aren’t the same thing. 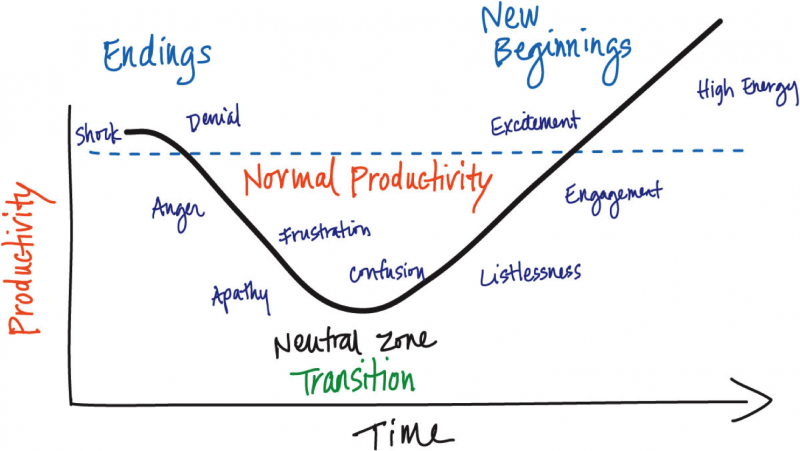 Change is situational: the move to a new site, the reorganization of the roles on the team. Transition, on the other hand, is psychological; it is a three-phase process people go through as they internalize and come to terms with the details of the new situation that the change brings about. At any given moment, any of us can be at any stage of transition: not necessarily the same stage, and it can all turn on a dime. I had been feeling so excited for Teen’s new beginning (less so for ours, but it has its highlights as well); his fear and anger evoked in me both sadness that he was having such a difficult go of it and a panic that he might ditch the opportunities before him. With a travel day on either side of the two-day orientation, over four days we watched Teen ride an emotional roller coaster, moving at break-neck speed through All the Big Feels related to this transition: loss, grief, loneliness, anger, denial, resistance, despair, excitement, hope, doubt, fear… We saw him wipe away embarrassed tears, endured his angry barks, listened when he overflowed, all in snippets of time that our orientation tracks intersected. We encountered so many moments confirming his choice of school, from conversations with staff, to the presentation by his major advisor, to watching him make friends. And our conversations with other parents confirmed that our experience was far more common that we could suspect. One dad said, “I am so grateful for that transition presentation, because I’m watching my son live it out before my eyes.” Yup, us too. Another dad said, “To look at people, they seem like they have it all together. But when you talk to other parents, you realize that we’re all dealing with the same things, the joys and fears, anxieties, situations…” So true. Teen had a great roommate for the dorm overnight. At a different stage in his own transition, they talked from 9:30 pm to 1 am, helping Teen process in ways his parents could not. That next day Teen was like a different person, calm, tip-toeing into the excitement of all to come. But later that day he talked with friends from home, one who was freaking out and another who was currently at his own college orientation. They’re all on this crazy ride and they’re jostling each other this way and that. Back home we are orienting to the present moment, enjoying summer and friendships and down-time. The college shadow looms, but for now he wants to stand firmly in the sun. And that’s fine. Orientation introduced us to new surroundings both physical and emotional. We’ve done a lot of healthy processing of emotions and details. Settling in will take time.